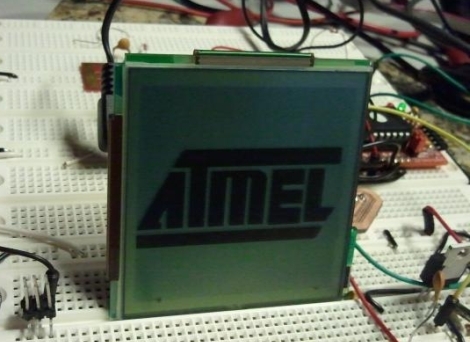 Even though it’s a bit late for April Fool’s jokes, [Ameres] wrote in to share a project guaranteed to catch your friends (or enemies) by surprise. Like us, he had some old CD-ROM drives sitting around and thought that there must be some way to put them to good use. He gutted one, saving the laser’s carrier unit for use as his mechanical trigger. He placed the unit above a doorway, soldered a pin on to the end of the laser carrier, and positioned a water balloon at the end of the CD-ROM’s rails. The laser carrier’s motor was then connected to a photocell located about half way down the side of the door. He mounted a laser on the far side of the door, which is pointed at the photocell. Once the laser beam is broken, the CD-ROM motor is actuated, popping the balloon over the unsuspecting victim. Have any ideas as to how he can make a bigger splash with his friends? Share them with us in the comments. [Norman] put together a rather impressive 22,500 uF capacitor bank. In addition to find things to torture with the strong magnetic field generated by a sudden discharge, he’d like to measure the current pushed from the device. 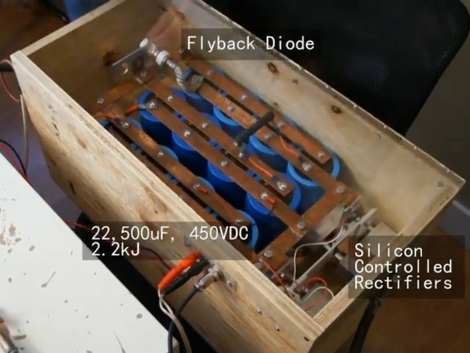 He’s found a way to do this using a digital storage oscilloscope. To protect the oscilloscope [Norman] built his own interface box that includes a 50x voltage divider, and interfaces a current sensor called a Rogowski coil. 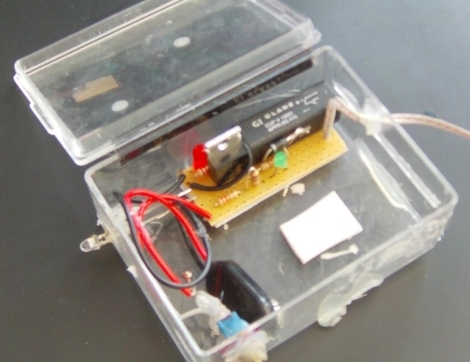 When it comes time to run the experiment, he turns the safety lock-out key on the bank charger, then discharges the stored potential with the flip of a switch. Take a look at the video after the break to see soda cans and hard drive platters mangled by the device. The oscilloscope measures the output near 10 kA, giving [Norman] the data he set out to capture. He’s entered this project into the Tektronix contest where it’ll compete with the piano tuner and laser light show tester just to name a few. [John W. Linville] wrote a digital video player for the Tandy Color Computer (aka TRS-80). The decades-old hardware performs quite well considering the limited resource he had to work with. 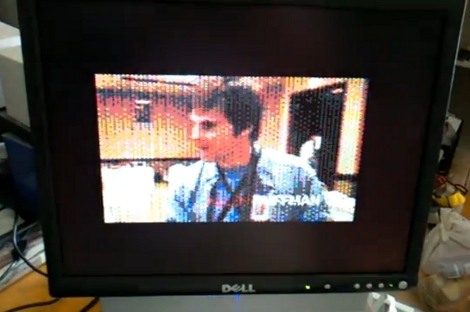 This is the second iteration of his player, and can be seen after the break playing a promo video for CoCoFEST 2011 where he’ll show it off in person. In the most recent thread post (at the time of writing) [John] shares the methods used to get this running. FFMPEG is used on a modern computer to process the source video by separating the audio into an 8-bit 11040Hz file, and it generates several PPM files with the proper video frame rate. ImageMagick takes it from there to convert the PPM files to a bitmap format. It also processes each frame for differential changes, reducing the size to fall within the available bandwidth. They are then interleaved with the audio to produce the final format. Video is 128×192 with rectangular pixels. [John’s] already used it to watch such classics as War Games on the antiquated hardware. While the Kinect is great at tracking gross body movements and discerning what part of a person’s skeleton is moving in front of the camera, the device most definitely has its shortfalls. For instance, facial recognition is quite limited, and we’re guessing that it couldn’t easily track an individual’s eye throughout the room. No, for tracking like that, you would need something far more robust. Under the guidance of [Krystian Mikolajczyk and Jiri Matas], PhD student [Zdenek Kalal] has been working on a piece of software called TLD, which has some pretty amazing capabilities. 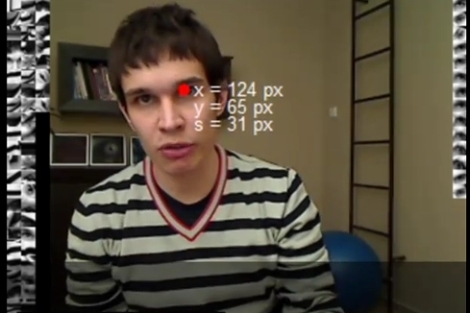 The software uses almost any computer-connected camera to simultaneously Track an object, Learn its appearance, and Detect the object whenever it appears in the video stream. The software is so effective as you can see in the video below, that it has been dubbed “Predator”. Once he has chosen an object within the camera’s field of vision, the software monitors that object, learning more and more about how it looks under different conditions. The software’s learning abilities allow it to pick out individual facial features, follow moving objects in video, and can recognize an individual’s face amid a collection of others. While the software can currently only track one object at a time, we imagine that with some additional development and computing horsepower, this technology will become even more amazing. [Trav] was pondering virtual reality and decided it was no longer all that it was cracked up to be, so he created an experience in what he calls “Remote Reality”. While we have seen many installations over the years that allow people to remotely interact with objects across the globe, his Orbduino project consists of more than simply toggling lights on and off (though he’ll let you do that too). In his house, he has set up a robotic playground of sorts that allows anyone who visits a chance to play around with the robotic arm he has installed there. The arm is situated in a pen filled with random objects which can be stacked and moved around. He also promises to show you something fun, provided you can guide the arm to pick up an object and hold it against the target positioned outside the pen. He didn’t forget the obligatory remote light controls either. You can turn the overhead lights on and off, as well as control a multi-colored orb situated in the corner of the room. Most of the project’s interface is done with an Arduino Mega, which handles the robot arm interface, as well as messing with the light installations. 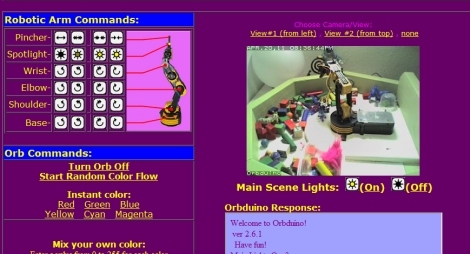 If you have some free time, swing by his site and give the robotic arm a try. It’s a fun little time waster that you will likely enjoy. Just make sure to take it easy on his web server! Spring is upon us and Instructables user [Mischka] decided it was a good idea to combine two flavors we never considered putting together: The Easter Bunny and the A-Team. He decided to build the egg as an Easter gift for his brother, who is a huge fan of the A-Team. 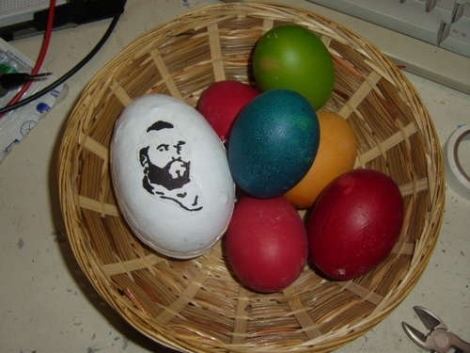 He found a slightly larger than normal plastic egg, and proceeded to paint the shell white, adding a printed picture of Mr. T once the paint had dried. The guts of the egg are made up of a Picaxe 08M micro controller mounted on a Picaxe protoboard. Rather fond of buzzing, beeping audio, he decided to forgo a normal speaker and opted to use a piezo instead. To activate the music when the egg is shaken, a tilt switch was added to the board as well. He uploaded his software to the Picaxe, sealed up the egg, and called it a day. We can imagine his brother will be pretty pleased with the creation – who wouldn’t be? We only wish that there was video of the egg in action.